Have you chimed in for Decongestion Pricing? – No More Freeway Expansions. Have you chimed in for Decongestion Pricing? Monday, June 25 marks the final meeting of ODOT’s Value Pricing Committee. We sent a letter (with over 200 signatures!) to the committee last month asking for bold leadership from the advisory committee to support decongestion pricing. Last month, ODOT revealed their research which stated implementing decongestion pricing on I-205 and I-5 would result in an 11% reduction in traffic congestion REGIONWIDE and would raise nearly $300 million in revenue annually. That’s a lot of money that could go towards transit investments! Decongestion Pricing is Great! We want to see decongestion pricing implemented as broadly and ambitiously as possible. Decongestion pricing needs to be implemented for public health, climate mitigation, and congestion relief purposes. It must be installed equitably and thoughtfully. Every dollar raised from decongestion pricing should be redirected into transit, biking and walking projects, not more freeway expansion. Spending money from decongestion pricing on freeway expansion is like using revenue from a carbon tax to build a coal plant or pipeline. We encourage TriMet, CTRAN, Metro and ODOT to work closely with frontline communities to determine how to allocate these resources towards investments in reliable, efficient, and effective transit, biking and walking. We encourage the exploration of mitigation of congestion pricing on vulnerable communities through the exploration of rebates, funding safety improvements on nearby high crash corridors, and strict initiatives for data privacy. 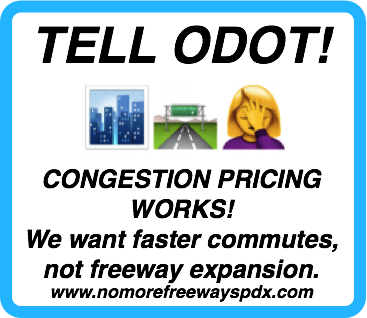 Wanna testify in support of decongestion pricing and in opposition to freeway widening in person? Join us! There will be an opportunity to engage with ODOT and the Oregon Transportation Commission on Decongestion Pricing on July 12 at Portland State University as well. Stay tuned for more information! PEDALPALOOZA: COME LEARN ABOUT FREEWAY REVOLTS! 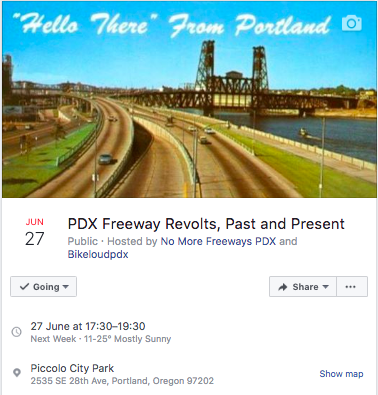 No More Freeways PDX and BikeLoudPDX are partnering for a Pedalpalooza Ride in which we discuss Portland’s illustrious history with fighting freeway expansion. Did you know about the effort to protect NW Thurman from Interstate 505? 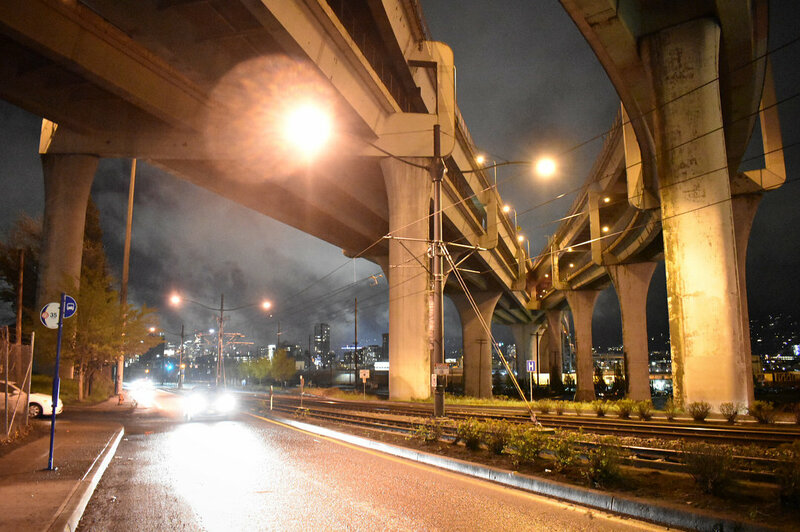 How Portland’s community advocates fought the Mt Hood Freeway to get funding for the first MAX line? Did you know that Robert Moses’ team drew the maps for where many of Portland’s freeways would be built? Ride with us to learn about Portland’s illustrious history of community opposition to freeway expansion! We’ll start in Southeast Portland’s Piccolo Park (originally bulldozed to make way for the Mt Hood Freeway!) and swing through town to see the scars left in the inner city from freeway expansion. We’ll conclude near the Rose Quarter, where ODOT keeps trying to spend half a billion dollars on freeway expansion despite the fact that it’s, you know, 2018, and that any sensible investment in our region’s transportation system considerate of public health, equity, carbon emissions or congestion relief involves more transit, biking and walking instead of lanes of freeway. We’ll be joined by PSU Professors Sy Adler and Aaron Golub, and community advocates who have fought for livable streets for decades here in Portland. Our route will be slow, family-friendly, and relatively short, but it’s not a loop, so plan ahead. North Portland resident Paul Rippey wrote a wonderful song about induced demand, freeway expansion, and the need to invest in transportation. 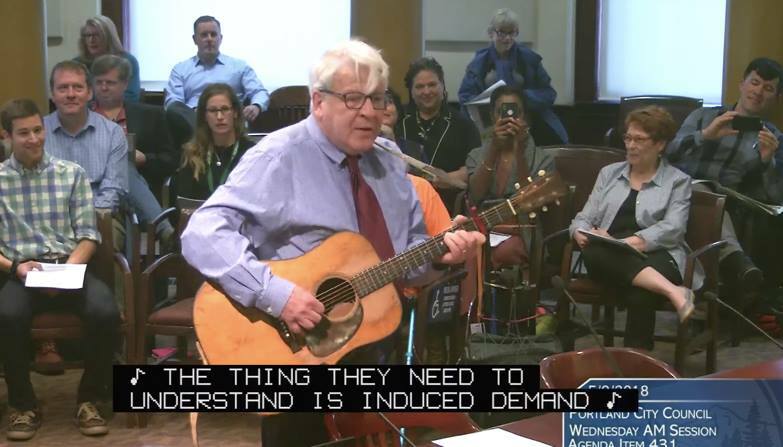 He was kind enough to perform the song in front of Portland City Council last month, and he’s deservedly gone viral. Check out Andrew Theen’s coverage in The Oregonian about Rippey’s song to get this infectious little diddy stuck in your head. We’ve got a *lot* cookin’ in the fall, and we’re going to need your help. Freeway fights are long, arduous, obnoxious, but we promise you: we’re in it for the long haul. If you haven’t already, like us on facebook, follow us on twitter, and invite your friends to do the same. If you’re feeling particularly generous, we could use a little financial support as we gear up for the fall.